2010 Junior MGP race winner Michael Sweeney signalled his intent with the fastest lap of the first timed Manx Grand Prix qualifying sessions. The Skerries man, one of the top ten seeds in the new qualifying system, posted an impressive 116.299mph (19:27.91) on his R6 Yamaha to top the Junior leaderboard from Stephen Harper (114.279). James Cowton, who finished fourth in last year’s Junior MGP and won the newcomers C race, showed he will again be a contender in the Junior Race on Wednesday week with the third fastest time of the night (113.797) with Stephen McKnight also posting a lap in excess of 113mph. Sweeney later switched onto his ER 650 Kawasaki and posted the fastest lap of the SuperTwin session with 110.238 (20:32.12 although 1993 Formula 1 TT race winner Nick Jefferies, who also won the 1983 Senior Manx Grand Prix clocked a notable 107.278mph (21:06.12) on his first timed session on the Mountain Course since 2002. Dave Taylor topped the Lightweight session with a lap of 104.087 (21:44.95) from Dave Corlett (103.065) and Anthony Redmond (102.522). 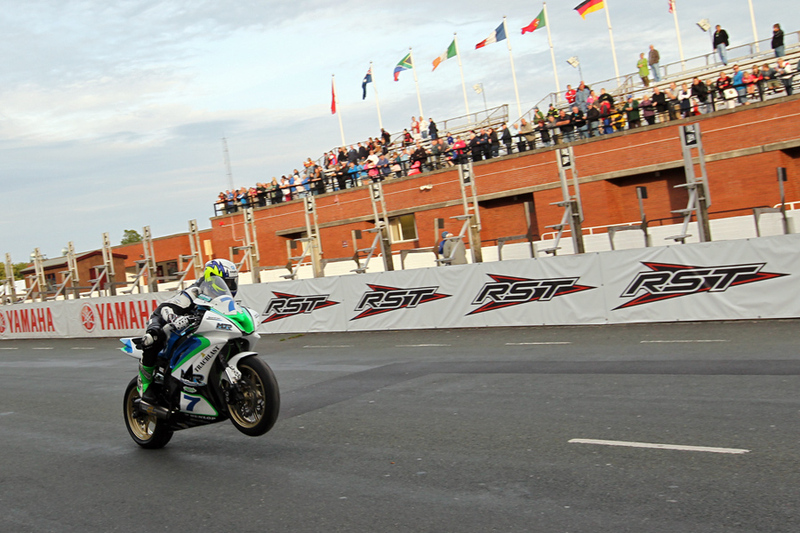 An impressive group of newcomers posted their first 100mph plus laps led by Neil Lyons from Drumree in Northern Ireland. Marc Livesey, Jason Corcoran, Christopher Dixon, Richard McLoughlin and Anthony Cooper all showed early promise ahead of the Newcomers A race scheduled for Wednesday 28th August, posting laps in excess of 105mph. Callum Collister (103.599) topped the Newcomers B Race with Ben Rea (98.077) the fastest in the Newcomers C class. Tomorrow’s MGP session starts at 18.20 for Senior, Junior, SuperTwin and Newcomers A with the Lightweight and Newcomers B and C going together with the Classic machines at 19.05.